Dr. Goldberg is an internationally recognized surgeon, researcher, and teacher. 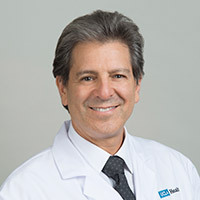 He has developed many new surgeries which are now taught and practiced internationally, including less invasive treatments for eye and orbit cancers, new surgeries for Thyroid eye disease, new surgical techniques for tearing problems. He has had leadership and Executive positions in the American Society Ophthalmic Plastic Reconstructive Surgery, California Academy of Eye Physicians and Surgeons, American Academy of Cosmetic Surgery. An eye twitch is an involuntary, abnormal blinking of your eyelid. This abnormal blinking may happen many times per day. If eye twitching is severe, it can impair vision. Ptosis is when the upper eyelid droops down more than it should. If the ptosis is severe, it may block vision. Multiple awards including the Senior Honor award of the AAO, both the Lester Jones Anatomy award and the Henry Baylis awards, ASOPRS. Invited featured speaker at multiple national and international meetings, including named lectures.